A Growth Enhancer designed specifically for Orchids - Orchid ULTRA can encourage and support bushier growth, brighter flowers and long term performance. ULTRA solutions are blended from highly active plant extracts and are richly endowed with pure humic and fulvic acids. They are highly concentrated - a little goes a very long way. Ultra solutions are especially recommended for specimen plants grown for sale or exhibition. 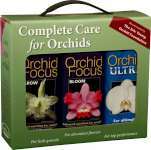 Orchid Ultra is recommended for use with all of the major orchid species and hybrids - full instructions supplied. Ultra Solutions are not fertilisers, they are growth enhancers. A proper mineral nutrient solution/fertiliser, such as Orchid Focus will also be needed.